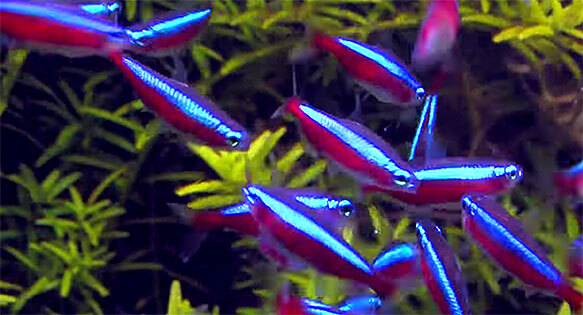 Screenshot from DocAquaTV’s “100 cardinal tetra in an aquascaping tank” video. I can’t quite put our finger on it, but there’s certainly something to be said for our innate preference for larger, even numbers. Like 100. 95 is nice, but 100…that makes a statement. So much so that 103 would probably be too many – at that point you’re just showboating. 1. DocAquaTV opted to show you a planted aquarium and the feeding of live baby brine shrimp to 100 Cardinal Tetras, creating a feeding frenzy reminiscent of a pack of piranhas. 2. Spyros Stavropoulos replicated the DocAquaTV feeding experiment that unequivocally proves that 100 Cardinal Tetras must be related to piranhas. In fact, maybe they’re just the juvenile form of piranha. 3. JeffTeo8 gave 100 Cardinal Tetras a planted aquarium with a large upright driftwood feature that gives them something to swim around in a calm, tranquil manner. I will award bonus points for “Best Schooling Behavior in a Cardinal Tetra Video”. Yes, this is a freshwater film festival afterall. 4. AquaPorto1 used 100 Cardinal Tetras to create a sly, artistic video composition of shifting focus and panning around the tank, reminding us that it’s really emotionally draining to be just one small fish in an endless sea of 99 other tetras. Of course, in looking into the strange numerology of 100 Cardinal Tetras, I also discovered the parallel dimension version – 100 Neon Tetras. What I found most perplexing is that the Internet seems to demand that 100 Cardinal Tetras require a dedicated aquarium, with no other fish present to disrupt or otherwise disturb these obviously very sensitive fish. 1. Jeremiah Tan chooses to keep his 100 Neon Tetras entertained with some Congo Tetras and at least one Rummynose as well. 3. Loki Shin knew Jeremiah Tan was onto something with the Congo Tetras, but he upped his game with Silver Dollars and a Flag Tail Prochilodus as the ringleaders for his 100 Neon Tetra mob. 4. TatooJeff88 raised the bar on on giving 100 Neon Tetras a true feeling of being back in the wild, complete with Leopoldi Stingray…and some Datnoids? (I have a feeling this ended really well…for the Datnoids who are much larger a month later). 5. I guess if you’re willing to ignore the supernatural requirement of 100 Neons, and opt to stock a “Zillion” Neon Tetras, they finally have enough friends that you’re permitted to overlook the apparent requirement of other large midwater-swimming tankmates. But apparently you’re still not exempt from the requirement of giving them some sort of non-Neon-Tetra companions. FischbottichTV Nils shows us that Coryrdoras cats will suffice in such rare circumstances.